1 Why Use Pop Up Widgets on Your Blog? Pop up newsletter forms are the best email marketing strategy to grow subscribers on your website. This marketing strategy can rapidly increase your subscribers in no time. Expert says, “whenever a user visits your site, you only have 5 seconds to impress them or they will instantly leave your site.” In this case, pop up email capturing widgets can help you out by showing exciting offers, newsletters, bonus tips, viral content, sign up form, etc. on your blog! For example, you can use pop up newsletter forms, other email collecting widgets, etc. on your site to keep your visitors up-to-date. with exciting offers. By doing this, your current engagement will increase and it will also help you to convert your 1st-time visitor to a lifetime subscriber. In this tutorial, I will show you step-by-step how to add email popup forms to your blog. Why Use Pop Up Widgets on Your Blog? As I mentioned above, there are many benefits of using it on your blog and the best part about this is, it’s mobile-friendly. These forms also work on mobile devices. During my research, I have found that the number of mobile internet users has increased in the last 12 months analysis. This is a great opportunity for website & blog owners to reach more audiences on mobile devices. Here are some benefits of using pop up gadgets on your blog. Capture more emails in a faster way. Grab visitors attention by providing beautifully designed forms. Increase current engagement between your subscribers. Generate more leads, provide a newsletter, blogging from scratch, questionnaires, start here, etc. 2. You can use external or 3rd party websites to easily create and add popup forms to your blog. This method is best & simple for newbie bloggers. In this post, I will show this tutorial using the 2nd method. Here are some websites that offer free pop up email collecting gadgets. 1. Visit GetSiteControl and sign up using your Facebook account or Gmail account. 2. Once you’re signed up, enter your name and website URL. 3. During the sign-up process, you need to verify your blog by adding a script to your blog. Copy the code and paste it on an HTML widget from your blog and click verify. 4. Once you’re verified, click on Create Widget, customize it and save it. 5. Activate the gadget and you’re done! This email marketing strategy always worked for me to collect lots of email subscribers. So, if it worked for me then obviously it will work for you too. Give it try and get the desired result. 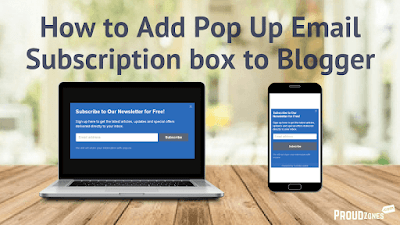 Already applied pop up newsletter forms to your blogger blog? Let me know in the comment box below.